RBTH presents a selection of views from leading Russian media on international events, featuring analysis of the potential consequences of a nuclear agreement with Iran for Russia, as well as reports on Moscow’s extension of gas discounts for Kiev and a call by U.S. senators to strip Russia of the 2018 World Cup. Gazeta.ru has asked experts for their opinion on what the consequences of an agreement on Iran’s nuclear program could be for Russia. 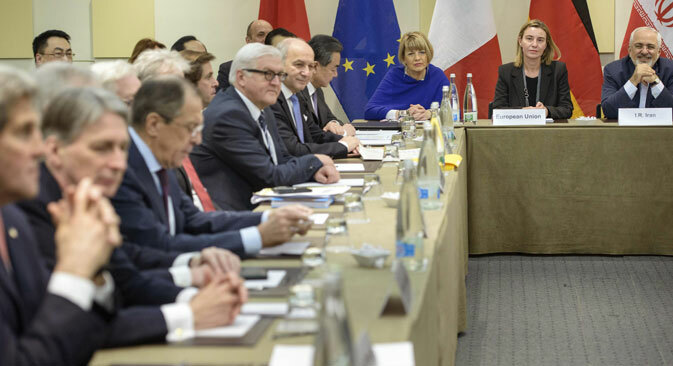 The publication reminds its readers that the tense negotiations between the P5+1 group of six major powers (the U.S., Russia, China, the UK, and France, plus Germany) and Iran) in Lausanne, Switzerland have already gone into a third day, but so far a final agreement has remained elusive. As Gazeta.ru notes, for Russia the outcome of the negotiations is crucial: There is a risk that after the signing of the document Moscow may lose an ally in the Middle East. “If sanctions are lifted from Iran, Russia will be faced with a struggle for competition with Western companies, and Iran will acquire more room for maneuver,” Chairman of Presidium of the Council on Foreign and Defense Policy Fyodor Lukyanov said in comments to the publication. According to Dr. Theodore Karasik, an expert on the Middle East, Russia needs a nuclear deal with Iran, as this would elevate Moscow’s status as a negotiator in the international arena. He also underlined that success in the Iranian negotiations would help Russia in the regulation of the conflict in Syria, where the Russian side is also playing an active role. The centrist newspaper Nezavisimaya Gazeta writes that Russian Prime Minister Dmitry Medvedev has signed a decree on the extension of discounted gas supplies to Ukraine. Moscow is ready to supply Kiev with gas at $250 per 1,000 cubic meters. The publication explains that this will allow Ukraine to acquire gas at a cheaper rate than directly from gas hubs in Europe. However, Kiev, writes the newspaper, is not able to purchase reserve gas even at reduced prices. The Ukrainian government is counting on the Europeans paying for its gas supplies: Kieve is holding talks with the European bank for Reconstruction and Development, the World Bank and other international financial institutions on the granting of loans for pumping natural gas into storage tanks in the summer period in order to create the necessary fuel reserves for the next heating season and ensure the uninterrupted transit of Russian gas to the EU. A group of 13 American senators has sent soccer’s international governing body FIFA a letter containing a “strong recommendation” to strip Russia of the right to hold the 2018 World Cup, writes tabloid newspaper Moskovsky Komsomolets. The authors of the letter believe that in the context of the sanctions imposed over Russia’s role in the Ukrainian crisis, the hosting of an event of this kind in Russia is inappropriate, is in contradiction of global politics, and strengthens the prestige of Russian President Vladimir Putin. The publication reminds its readers that this is not the first attempt by the international community to use sport to apply pressure to Russia: Last year American senators appealed to FIFA with a demand that the Russian team be excluded from participation in the 2014 World Cup over the events in Ukraine, a demand that was officially rejected. Furthermore, writes Moskovsky Komsomolets, representatives of the European Union had also earlier put forward a proposal to deprive Russia of the right to host the World Cup. It was suggested that European teams would boycott the tournament, as in the case of the 1980 Olympics in the USSR. For now, writes the publication, it is unclear what the outcome of this discussion will be – whether it will remain just words, whether it will be implemented partly or fully realized. Regardless of calls to boycott the 2018 World Cup in Russia, preparations for the tournament are continuing apace. Moskovsky Komsomolets tells its readers that the French city of Le Mans, twinned with Rostov-on-Don, has offered to help set up the football pitch of the future stadium in order to successfully gain FIFA certification, though France is one of the very countries to have imposed sanctions against Russia.